The picture above is of Dylan Howe's group the Subterraneans performing their Berlin/ Bowie set in the Akademie der Kuenste. One of the great things about this first Berlin Festival with Richard Williams as Artistic Director has been to show a Berlin audience and the listening public of all the ARD public radio stations more of our scene. Dylan Howe has lived this project for years, and for him to have the opportunity to bring it to Berlin, agsainst a backdrop of atmospheric 70s film footage was clearly a big and emotional moment. The crowd loved it. Out in front was James Allsopp, for whom saxophone technique has never been any kind of barrier, and who completely rose to the occasion. Dave Whitford, Ross Stanley and Steve Lodder all gave a Berlin audience an insight as to the kind of top-flight musicians we have in the UK. 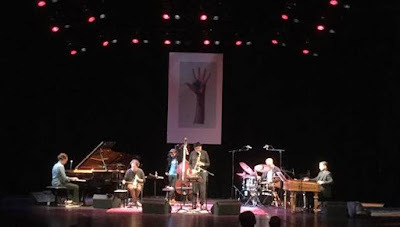 The main act of the Saturday night was Charles Lloyd's Wild Man Dance. 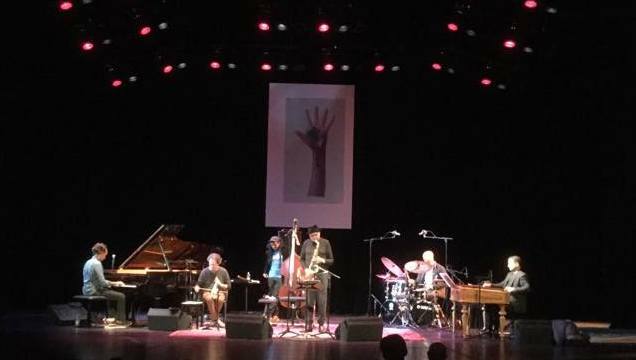 For me it was great finally to catch up with a project that others on this site have been raving about: Mike Collins reviewed the CD and Alison Bentley reviewed the gig at the Barbican last November. Their superlatives are not misplaced. Charles Lloyd when playing can sometimes be floaty and abstract, but occasionally he steps forward and provides decisive leadership, there are great moments when he has the band underlining and giving full weight to his every nuance. Also, every musician on stage responds to his clear call as bandleader to take the limelight for themselves, and show their full mettle. Drummer Eric Harland had been pateiently, delicately colouring in and providing a penumbra for every texture, but when the call came to do the full Buddy Rich show-off solo, he brought the house down. Cimbalom-player Miklos Lukacs is another huge musician, who knows how to shade in discreet backgrounds. As soloist he has a jaw-dropping stylistic range. He can not only provide authentic Hungarian cimabalom, but must somewhere have spent many hours listening to and channelling the essence of Keith Jarrett. Remarkable. I also made a cameo appearance at the festival and had the privilege to end my birthday on Saturday introducing Laura Jurd's Dinosaur Quarter in German on the stage for live radio for their late night gig. They proved very popular. From several conversations I had at the festival there is no doubt that Elliot Galvin's visibility on the continent is growing all the time.